As people have a chance to read the book, I would like to provide room for them to share their reactions, particularly if they participated in or were directly affected by the events of 1981. I received this e-mail today from Elliott Simons. Elliott was a controller who served as the spokesperson for PATCO's local at Baltimore-Washington International Airport in 1981 and he lost his job for striking. He has agreed to let me post this message and a link to an article he wrote explaining his actions back in 1981. Perhaps others will want to also share their stories with me: jam6@georgetown.edu. I was vacationing when you did the Diane Rehm show, but someone sent me the link so I could listen to it. Thank you for doing the research and writing the book. passed his huge economic package and was riding as high as ever, and then he got shot, thus the signals were clear. A political fly-in was scheduled shortly after Reagan got shot in attempt to lobby members of Congress to our cause, and the general feeling was that it should be postponed, but it wasn't. Then an amazing thing happened that could only be seen as an omen: at the end of the day a rally was held on the Capitol steps, but about 15-minutes before that rally, with TV cameras rolling, a freak early-spring thunderstorm rolled in and it poured -- I ran for cover, thinking that someone was trying to tell us something. The Leyden coup, followed by Robert Poli, was very confusing. I went to a Congressional hearing and sat a few rows behind Poli as he defied Congress, and I wondered who this person was and if he knew what he was doing. I participated in the strike against my better judgement, but only because even without the 80-percent, and knowing that we had been training staff people to re-gain their air traffic currency, I still didn't think the FAA could sustain the strike. The worst thing that could happen was to not go on strike and there be a settlement. I could not risk that even though I was quite certain our careers were over. Boy does this article bring back memories; I got my initial training at Columbus, Ohio and thought I was pretty hot. I transferred to Oakland Bay Tracon, a complicated traffic control area, in 1964 due to my wife's health. The instructors there were tough but fair, but lots of “wash outs,” After several months of training I was getting my final "check ride" on the SFO finals. My final "ride" was with one of the toughest crew chiefs and when the coordinator slapped down a strip of a commercial jet and instructed me to fill a six mile hole and don't f... it up I did and passed the check ride and became a FPL right after I went to the bathroom. When I was fired I was a GS14 step 7 making about $45,000 a year with overtime. My non air traffic controller friends told me I was stupid. I look now at what the pension’s air traffic controllers are being paid now I sometimes think I was. Thanks for sharing this, BloggerGeorge. I forgot to add in the 1971 successful sick-out I was the PATCO rep at the Oakland Bay Tracon and when I was fired I would have been eligible for retirement in another 2.5 years of service but with all my fellow controllers on the picket line I could not cross it and if there would have been a successful conclusion it would have been 2.5 of stressful working conditions. Hello, Dr. McCartin it's me Pablo Farias Dezontini. I'm very happy and glad to find you and to have the opportunity to join your blog. My research about Brazil ATC Strike is just begining and your book and blog will be very helpful. Thank you for your cooperation and let's try to be in touch to exchange some ideas. As a Controller, Pilot and Historian I'm very anxious to learn. Thank you and I will buy your book soon sorry I won't have an autograph... I send the link of your blog to my Very Competent U.S History Teacher also. see you! 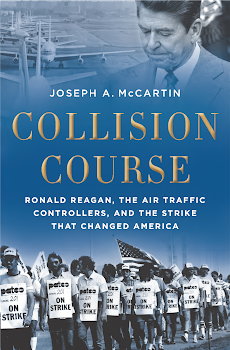 I just finished your book and was hoping see something about the national news media covering the Bay Area controllers walking out on the FAA Admin. at a lunch on his tour to try to sooth the hostile situation after the 1970 sickout and some information about the class action suite brought by some 1,000 ex controllers for age discrimination. For me the last fourth of the book became stale when most of the book was about other labor disputes. As far as some controller being rehired I had no hard feeling toward them except for some of our past PATCO leaders that were rehired becoming active in NATCA and NATCA blocked the FAA from hiring more of the fired controllers. Thanks for sharing this, BloggerGeorge. I wish I had had a chance to interview you for the book, for no one else mentioned people walking out on Administrator Shaffer at a lunch when he came to the Bay Area after the 1970 sickout. It doesn't surprise me though. That's a detail that confirms what I suggested elsewhere in the book about the fighting spirit of Bay Area controllers. I'm sorry that the book seemed stale for you when it explained the impact of your strike on other labor disputes in the 1980s and since. But as I researched your story I became convinced that what happened to PATCO was even more significant for people outside of air traffic control than it was for the controllers who were fired. As badly as the strike affected you and others who were fired, I think it was even more devastating for what it set in motion in the nation at large. I wanted people to make that connection and see your story as part of the larger story of what has happened to working people over the past 30 plus years. Thanks again for sharing your reactions. I though it was a great book. My comments about part of the book being stale were probably because I had already realized the impact the strike had on labor unions. Were you aware of the class action suit and also what you thought of my comments about some of the rehired PATCO leaders? Another comment the best I can remember PATCO did very little to aid other unions with their conflicts so I can understand why they had little enthusiasm to support PATCO. We thought we so powerful that we did not need any help. The union was hi-jacked by the Tea Party. The Postal Union is under threat of firing 120,000 postal workers. In 2005 Congress created a mandate for the Post Office to fund their Health Insurance 75 years in advance. With the recession the Postmaster is asking for relief from the punitive payments which has created a false crisis in order to open an opportunity to privatize the Post Office.